How should you handle barter and like-kind exchange? What about travel expenses if you don't end up buying the horse you thought you wanted at that auction in the next state? How should you compensate farm or ranch employees? What's the real difference to the IRS between a “business loss” and a “hobby loss”? Now you can reconcile your emotional and financial investment in horses with accounting that makes sense. 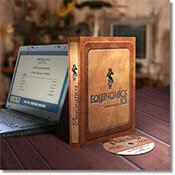 Get the breaks you deserve, and still enjoy the business you love, with Equinomics 101. Case studies and tutorials that are fun and easy to understand. 20-chapter study course covering everything from Barter and Like-Kind Exchange to Horses: Business versus Hobby. How to do a six week rolling cash work sheet, a simple strategy Equinomics 101 author Richard B. Dicks uses to get companies out of cash flow problems. Equinomics 101 is an equine accounting package designed to make accounting/bookkeeping for the horse business easier with College-level instructional guides, exercises and tests.